I would like to begin this year’s Code Purple season with our purpose. Yes, we feed people, give shelter, and items to those in need, but there is a much larger picture. We LOVE people….right where they are at in this moment. Some are in the darkest moments of their lives. We love because Jesus loved us right where we were at, some in OUR darkest moments. He did not ask me to change to get His love. He freely gave it to me, even before time began. He loved me and then the change began. If I have Jesus in me then how can I NOT share it with everyone around me. Souls that think they could never be loved by anyone let alone the God of the universe. That they were created to be God’s children and that they have purpose in this life and that purpose is NOT to be used and abused or to use and abuse others. People changed when they came into contact with Jesus. Let’s be Jesus to people! Let our light shine and expose the darkness and wash it away. Please join us in caring for these precious people this season. I promise -you will be the one learning more about how much God loves you as you love on others. You will never be the same! 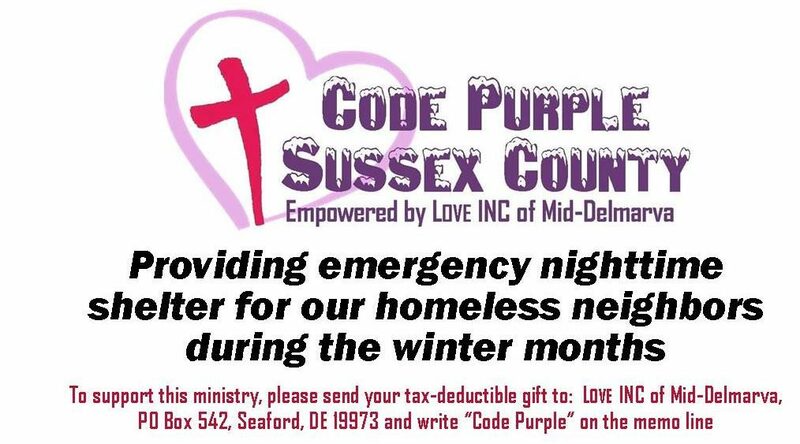 I am excited for this year’s Code Purple and I pray blessings for you all.